Chertsey branch arranger, Helen Kempster, and District Manager, Richard Leachman were invited recently to address a gathering of doctors and GPs at St Peter’s Hospital in Chertsey. The two, who have worked for Lodge Brothers for many years, delivered a presentation on the requirements of the local GP when dealing with the deceased and the funeral director. The talk, entitled ‘Where Our Paths Cross’, was well received by the 27 doctors who are at various stages of their training. The ‘question and answer’ session which closed their time together was quickfire, touching on many issues including the doctors’ dealings with families and the role of the coroner. Helen Kempster, whose discussions with her local GP opened up the opportunity to share with a wider audience, was thrilled with the morning. “It all went very well I feel”, she said. 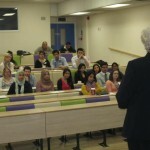 “The students wanted to learn and listened very intently to all Richard and I spoke about”.